This article helps you to understand what to monitor if you have or are bringing a new service to run in production. You don’t have software ownership if you don’t monitor it. You can’t say how much of availability your service had in the event of an outage. You have no clue if your service is getting slower over time and why it does so. Was memory high or was a dependency which affected your service? Or was a dependency of your service dependency? It might takes months or even years to investigate why a portion of your customers were getting logged out of your website, why they couldn’t list their account preferences during the night and so on. During outages, engineers need to use data to take decisions, otherwise they will always have to depend exclusively from the opinion and feelings of the most senior engineer around. The lack of monitoring is a massive DevOps anti-pattern. White box and Black-box monitoring types can both be used for monitoring. The former is based on systems internal metrics, and the latter is like testing from the outside as a user would see it. The google SRE book defined the term the four golden signals i.e latency, traffic, errors, and saturation. Error Rate: Because errors immediately affect customers. Response time: Because slow is the new down. error rates and the latency too. Saturation & Utilization: It tells how full your service is. If the Memory usage is 95%, can your response time keep stable? Processes: Threads Used, State, Running and Blocked, Disk I/O Utilization. Prometheus is an open source toolkit that takes care of both metrics and alerting on a large scale. It’s currently the fastest growing metrics-based monitoring system on the planet. Hosts metrics (CPU, Memory, Network & Disk I/O, and Process) are typically available on linux via procfs, they can be gathered via node_exporter prometheus integration. Prometheus manages to scrape their targets by calling /metrics endpoint on respective hosts. The http throughput, error and response time metrics can be instrumented by prometheus client libraries. I strongly recommend looking at opencensus project from Google. It’s a collection of libraries that collects metrics and distributed tracing for services. Whenever either a http request reaches your service endpoints or your service performs outgoing requests, metrics and traces will be generated out of the box, it’s amazing. Last but not least, you can export metrics and traces for multiple backends simultaneously. Alerts should be set for high response times and error rates. Ideally alerts should page on-call engineers when customers are affected. For capacity they should detect when hosts run out of resources that will lead to an outage, for example:DiskWillFillIn4Hours, SSLCertificateWillExpireIn2Days and so on. Avoid paging on-call engineers on root causes or low thresholds, just to name a few examples: NodeCPUTooHigh, NodeMemoryTooHigh, ConnectionRefused. Instead do over symptoms, tell what’s broken — TooManySlowCustomersQueries, TooManyCustomersCheckoutErrors. It does not end here, alerts should link to relevant dashboards and consoles that answer the basic questions about the service being alerted. Typically, a runbook contains procedures to troubleshoot systems. They should link to dashboards where service metrics, logs and traces can be found. Reduce MTTR (Mean Time to Resolve) by attaching runbooks to every alert o your system. 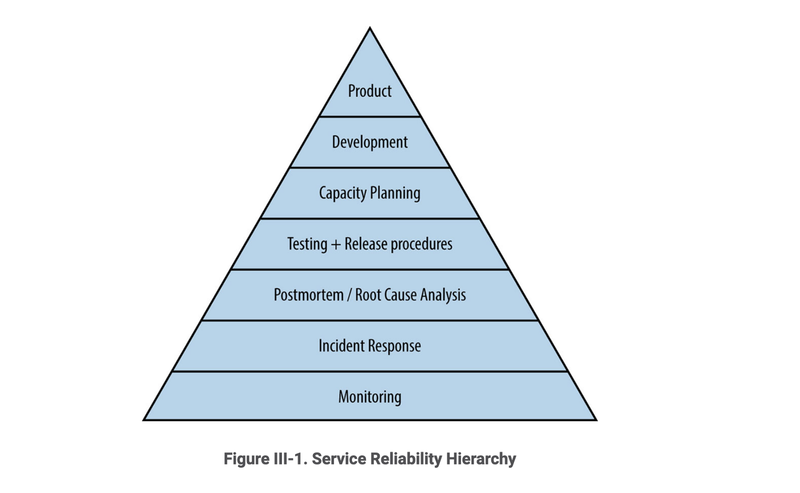 Monitoring is the bottom layer of the Hierarchy of Production Needs. It is a basic requirement to running a service in production, without it, service owners can’t tell whether the service is even working. I hope you enjoyed, thanks!